A very special bond of friendship comes from 44 years of working together. 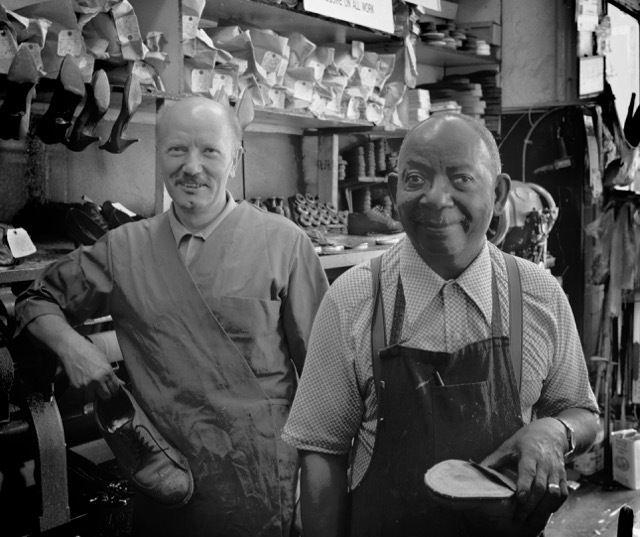 Phil Apolito's and James Parker's careers in shoe repair began when each went to work for Phil's uncle in 1946. 25 years later, when the Marine Barracks was built, the Navy Yard Valet moved across the street to its present location, a former pharmacy. James did retire, briefly, in 1980, the year Phil's uncle died. Two years later, the familiar sight of Phil and James, superbly creating frine footwear from our worn soles, was restored. Mr. Shin, the owner since 1980, is delighted to have these two fine men and the tradtion the bring with them. *There are two problems with this description: (1) James's last name is given as Taylor in one place and Parker in the other; (2) reference is made to the Marine Barracks being built in 1971, which of course isn't true -- the Barracks has been at Eighth and I Streets since Thomas Jefferson picked the location. If you can help us with James's correct last name, or if you can identify what changed at the Marine Barracks in the early 1970s, please contact us with that information so we can update this descriptions.